WorldClassRoom FAQs - How can I drop or withdraw from my online course? If you have fallen behind in your course, are struggling with course content, need clarity on course expectations, or are otherwise feeling like your aren't able to complete your online course, the Online Learning Center's Student Services team would recommend that you first contact your instructor and have a candid conversation about the challenges you are facing. You may find that you are able to come up with a solution which will allow you to continue in the course and complete successfully. Additionally, the Student Services team is here to support you with any questions you may have. You can contact us at studyonline@webster.edu or (866) 622-0888. If after contacting your instructor you still wish to remove yourself from the course, use this general information as a guide. Please consult the academic calendar for specific drop and withdrawal deadlines. A drop can be processed until the Friday of Week 2 of the term. A drop removes the course from your academic record and results in a 100% tuition refund. Following the conclusion of the drop period, a withdraw can be processed until the Friday of Week 6. Students who withdraw will have a "W" noted on their transcript. Tuition is refunded at a percentage depending upon the week in which the withdrawal was requested. Please see the refund schedule for specifics. If you are receiving federal financial aid, please be advised that any changes to your terms of enrollment as reported on the Webster University Financial Aid application may result in changes to your financial aid award. It is recommend that you consult with the Office of Financial Aid prior to changing your registration. 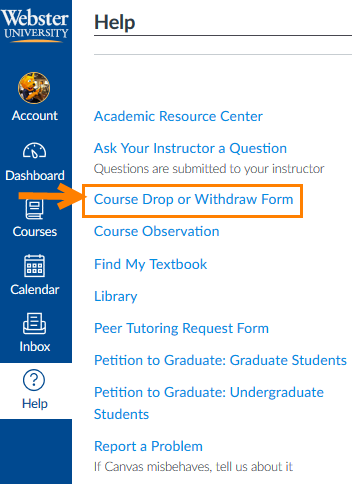 Students in online courses have access to an electronic drop and withdraw form. 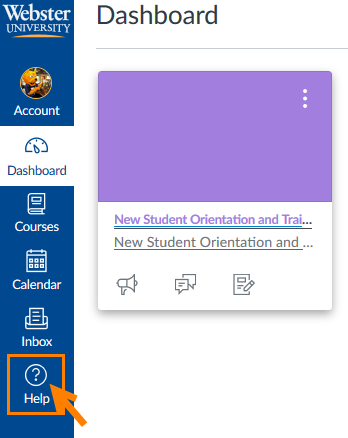 This form is available inside WorldClassRoom, under the Help icon on the left side in the global navigation menu. Once submitted, an electronic copy of the form is sent to the the Academic Advising Center for processing, and a copy to you at your Webster University email account. A member of the Academic Advising Center team will contact you shortly after receiving your request. A tip: you should also be sure to check your registration status in Connections's Student Academic Services area within 1-2 business days to ensure your registration appears as expected. As a student, what do I need to know about federal financial aid?